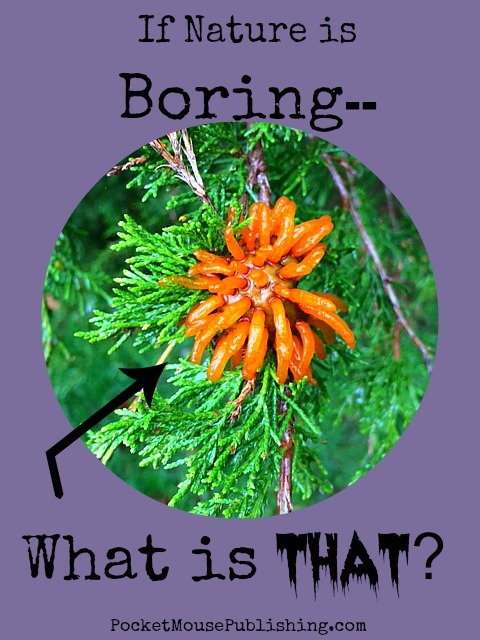 What would you do if you came across an orange tentacled blob in a cedar tree? And not just one? But another, and another, and one with even more tentacles? c) Email the county’s pest control department? d) Pluck to one to dissect in the name of science? e) Call…whoever would be interested in an alien sitings? After coming home and finding some of these bizarre apparitions on the cedar trees in both my neighbor’s and my yard, I chose answer C.
And the calm, kind urban forester who replied to my email assured me that this was fairly common in my county and not of concern unless I had an orchard. 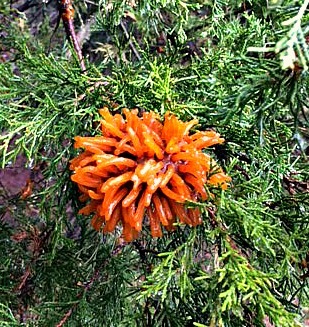 Which now I’m glad I don’t have an orchard because this is Cedar Apple Rust (not an alien invasion). These are Gymnosporangium juniperi-virginianae galls with spore horns (not orange tentacled blobs): a complex pathogen that requires both the apple tree and the cedar tree (with other species such as hawthorn and juniper standing in), adequate moisture, including a rain, and has a two year life cycle. You can read all about these fascinating galls on Cornell University’s Integrated Pest Management Fact Sheet. So, the next time you think just another boring nature walk, think again. And carry a camera — might just find something incredible for your Earth Day Celebration rainbow walk!